I feel like it's hard to just let kids be kids nowadays. School is more rigorous than ever, with art, music and recess getting clipped back at every chance. And there is the after school chaos of lessons, practice, tutoring and somehow fitting in all the assigned homework. By the time they get off the bus and home from various activities, there's barely anytime to eat dinner, let alone play. Yet, we also live in a very technologically driven world. When kids finish their homework, they immediately take to a screen. I don't love this trend, so we do our best to direct the girls to using their imagination to play with toys or expending energy playing outside. So when they do use a screen, we try to make it count. We aim to make screen time fun and educational. 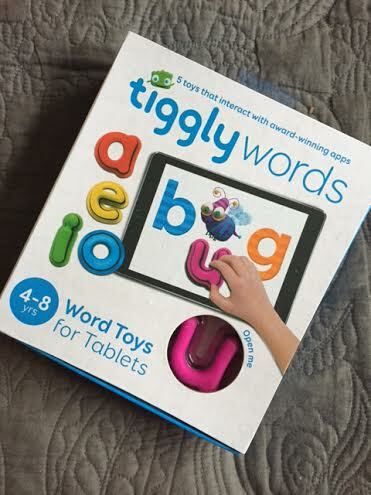 We have a few apps and websites we like, but by far one of our favorites is Tiggly! Tiggly makes learning fun and interactive by developing learning systems and combining toys with specially developed apps which interact with the toys. Each program comes with a collection of shapes, grids or letters. These Tiggly Toys have silicone touch points so your tablet reacts to them just like your fingertips. Tap and the screen reacts. When the girls were younger, we enjoyed their Tiggly Shapes , which comes with 4 shapes (triangle, square, circle and star) to use with a variety of apps that taught everything from animals to spanish. The programs encouraged storytelling and creativity while helping them grasp the concept of shapes all around them, which the girls thought was so fun! 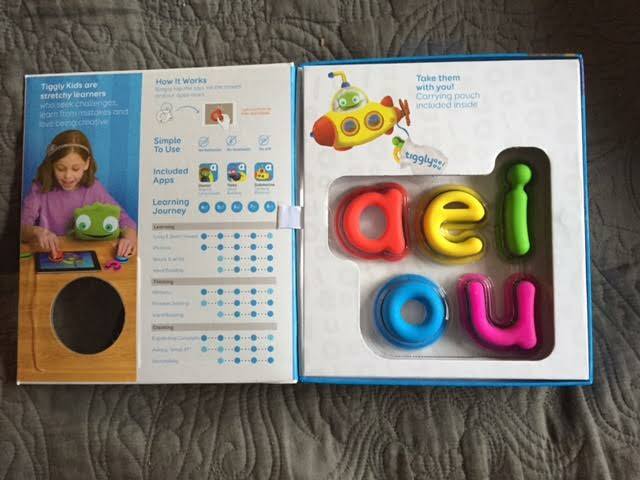 Now that the girls are older, we've upgraded to Tiggly Words , the company’s first learning system for early literacy. Tiggly Words is a set of five vowel toys (a, e, i, o, u) designed by educators to interact with Tiggly's three new iPad apps: Tiggly Submarine, Tiggly Tales and Tiggly Doctor. Learning language skills is an exciting milestone for every child, and Tiggly Words focuses on helping preschoolers recognize phonemes, construct sounds and learn words. Bug is almost 5 and yearns to read like her 7 year old sister, Chica. Using the letter shapes with the Tiggly apps on the iPad, Bug has made great strides and feels like she is catching up to her big sis! She beams with pride as she sounds out the words. The games are fun but challenge each of the girls on their level. There's nothing better than coming in the room and finding both girls huddled together, giggling over the game. To learn more about Tiggly, visit them on the web, Facebook and Twitter.